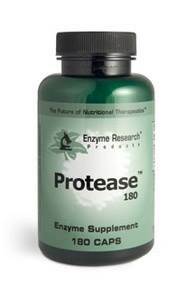 Protease is often advised by naturopathic practitioners in higher quantities, with the aim of helping to remove unwanted proteins from your circulatory system. A cleaner circulatory system will result in better blood flow, and help to restore your energy and balance. One of the tricks of an invading organism is to wrap itself in a large protein shell that the body would view as being "normal". Protease is thought to help remove this protein shell, and allow the body's defense mechanisms to go into action. With the protective barrier down, your immune system can step in and destroy the invading organism. Additional amounts of protease may also helpful in fighting such things as colds, flu's. Why is Protease? Enzyme Therapy right for me? Protease should be taken on an empty stomach to maximise its ability to breakdown protein-based invaders in the bloodstream. If Protease is taken with food in the stomach, it will begin to work on digesting that food instead of going directly into the bloodstream. However, if meat is a part of your meal, Protease may be taken with Digestive Enzyme for that meal, to help breakdown the protein in the stomach. Parasites, fungal forms, and bacteria are protein-based organisms that may be dissolved by Protease. Viruses have a protein-based film covering the nucleic acids inside. Cellular debris, undigested protein, and toxins are in the blood of these undesirable elements. Protease taken between meals may be beneficial in cases of infection, fever, inflammation, lowered immune response, hypolycemia, PMS, osteoporosis, candida, acne, cold, flu, and acute traumatic injuries. Protease may be taken by children, simply open the capsules and mix the powder with liquid. Contains no yeast,wheatgerm, milk/dairy, corn, sodium, sugar, starch, artificial colouring, preservatives or flavouring.